Russia's foreign policy may be made by the United Russia party, but that doesn't mean there is no debate. Russia’s complex, contradictory and at times even somewhat confused reaction to the events in Libya reflects fundamental differences in how various political forces in Russia define the country’s interests in North Africa and around the world. The most visible—and inevitably inflated—indication of opposing foreign policy philosophies among Russian elites was the reactions offered by President Dmitry Medvedev and Prime Minister Vladimir Putin to UN Security Council Resolution 1973. While Putin called the resolution, which established a no-fly zone over Libya, “moronic” and likened it to a “medieval call to crusade,” Medvedev defended the resolution on the grounds that the regime of Muammar Gaddafi committed crimes against its own people. With all the spotlights focused on the Medvedev-Putin duo, little attention was paid to the animated discussion of the Russian position vis-à-vis Resolution 1973 taking place in the State Duma. A statement prepared by Konstantin Kosachev, a deputy from the ruling United Russia party and chairman of the foreign affairs committee of the Duma, essentially sided with Medvedev and praised Russia’s abstention from voting on Resolution 1973. 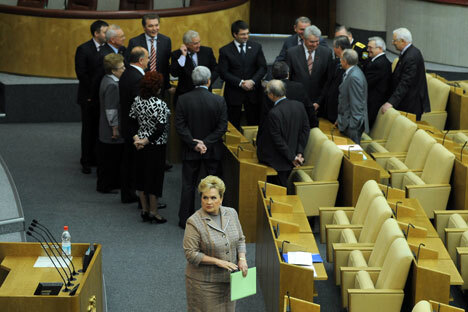 The statement was supported by the United Russia and Just Russia Duma factions; however, the deputies from the Liberal Democratic Party (LDPR) voted against it, whereas the Communists (KPRF) boycotted the vote. LDPR’s leader, Vladimir Zhirinovsky, criticized the Kremlin’s policy on Libya, arguing that Russia should have vetoed not only Resolution 1973, but also the previous Resolution 1970, which called for economic sanctions against the Gaddafi regime. In Zhirinovsky’s opinion, the Libyan crisis was provoked by the West as a pretext to military interventions in a number of Muslim countries, including Syria, Turkey, Saudi Arabia and Iran. This was not the first time that the KPRF and LDPR Duma factions refused to support President Medvedev’s foreign policy initiatives. At the end of January, both factions voted against the ratification of the new U.S.-Russian nuclear arms reduction (New START) treaty. The Communists were especially vocal in their opposition to New START, arguing—very much like the Republicans in U.S. Senate—that the treaty provided too many concessions to the opposing side. In particular, the Communists were furious that the treaty failed to establish an explicit link between offensive and defensive strategic weapons. They were also unhappy with the fact that the treaty would only count the number of deployed warheads instead of the total number. The constitutional majority enjoyed by United Russia in the current Duma makes it virtually certain that practically any foreign policy legislation proposed by the Kremlin will receive parliamentary approval. Besides, as far as international issues are concerned, United Russia can always count on the votes provided by the Just Russia faction. Interestingly, however, the Libyan crisis revealed a split within United Russia itself. During the Duma hearings on the situation in Libya, United Russia’s Konstantin Zatulin, first deputy chairman of the Duma committee on the Commonwealth of Independent States, strongly criticized Kosachev’s statement and stopped short of accusing President Medvedev of cowardice for his decision not to veto Resolution 1973. Eventually, Zatulin voted for the statement, yet a few days later, the United Russia faction stripped Zatulin of his deputy chairman position, explaining this decision as a need to “rotate” deputies. Zatulin always was a controversial figure. In his role as the facilitator of Duma policy in the post-Soviet space, he practiced an aggressive, muscular (some say “neo-imperial”) approach toward Russia’s neighbors. Often, Zatulin’s straightforward, undiplomatic statements caused uproars in the capitals of the “near abroad.” Three times he was declared persona non grata in Ukraine—the last time in 2008, when he called on the Ukrainian government to return Sebastopol to Russia’s jurisdiction—and in May 2010, he was denied entry to Azerbaijan. For many years, Zatulin’s views (shared, incidentally, by many United Russia Duma deputies) have been largely compatible with the Kremlin’s official line. However, since 2008, when the new presidential administration started crafting more nuanced and flexible foreign policy positions relative to its closest neighbors, Zatulin’s views began more and more to contradict those of the country’s leadership. At the moment, the face of Duma’s foreign policy portfolio—and by all accounts, its brains, too—is Kosachev, a competent and well-respected parliamentarian whose many qualities include the ability to maintain substantive conversations with biased and often confrontational opponents. In a recent article discussing the current situation in Libya, Kosachev made two important points. First, in his opinion, law and order in any country can be established only with the full observance of basic human rights. Second, he claimed that foreign intervention into domestic conflicts could be justified “when people’s lives are at stake.” The last point essentially rejects Russia’s long-standing position that the sovereign rights of a nation trump all other considerations. This point also echoes President Medvedev’s Mar. 21 statement on Libya, in which he introduced some elements of a values-based approach into Russian foreign policy. The next few weeks will thoroughly test Russia’s desire and ability to conduct a balanced and flexible policy on Libya. As the situation on the ground is rapidly approaching a stalemate, France is calling for a new U.N. Security Council resolution—this time explicitly authorizing the overthrow of the Gaddafi regime. Should such a resolution come to a Security Council vote, two things are likely to happen: Russia will veto it, and the Duma will approve such a decision in a unanimous vote.